It was an uneventful Wednesday night, all we wanted was Smart Water, perhaps a Nerds Rope or some Cinnamon Teddy Grahams. 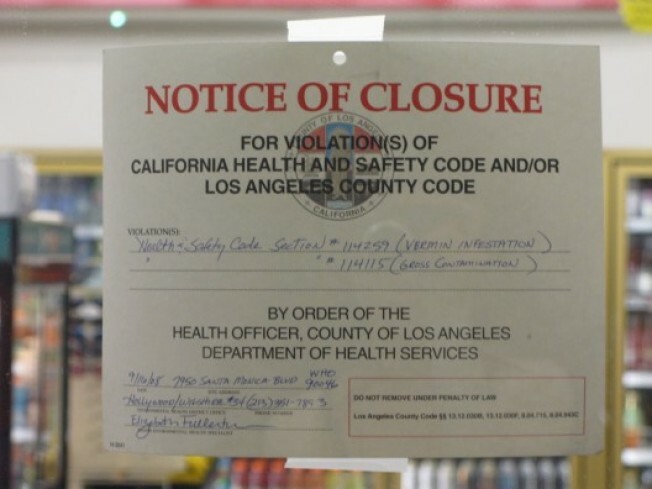 Heading over to the neighborhood 7-11—at Santa Monica Boulevard and Hayworth Avenue—we found a locked door and a handwritten sign saying the store was closed. Was today some sort of Thanksgiving/Easter/Passover super holiday? Upon second glance, there was a posted health code violation: Vermin Infestation and Gross Contamination. Who cares! All our desired products are packaged! Some dudes rolled up and we shared a mutual WTF Moment and tried to understand a world where 7-11 could just close without warning. According to said handwritten sign, the store will open again on Thursday at 3pm, because apparently it takes about a day to clear a store that's been grossly contaminated with vermin. OK fine, but that didn't help us, dangerously low on electrolytes and refined sugar and Whole Foods closed at 11pm. So not convenient.